Gardening with kids – use whatever you can find! 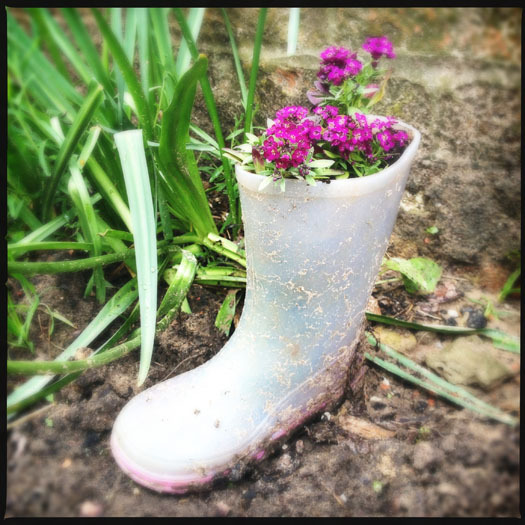 This is a really good idea for recycling old wellies, and makes a fantastic plant feature for your garden. This is fun activity for gardening with kids. Get an old welly, and carefully use a knife to cut a few drainage holes in the bottom. Fill up with soil or compost and plant with border varieties such as pansies, herbs like rosemary or even strawberries. We saw this example at Little Green Rascals, York. Additional ideas: You can use any old items for containers. A great one we are working on is an old kettle. You can try most small bedding plants, make sure they are watered well and feed every couple of weeks.